The microbiome is emerging as an important factor in disease development, progression and prevention. Researchers are trying to harness the microbiome and its role in immune response for therapeutic purposes. Gnotobiotic and germ-free mice will play a pivotal role for researchers. To better serve the research community, it is critical for model vendors to test and report on more microbes of interest and make available a variety of animal models for microbiome research. Rather than the traditional focus on exclusion of undesired pathogens, the field may need to move to reporting on microbiome components. These commensal organisms are typically not pathogenic, but can and do vary between animal rooms and can affect studies. One good example discussed further below is segmented filamentous bacteria. What type of testing is performed on gnotobiotic animals? Maximum reproducibility of study data in today's sophisticated biomedical research programs requires using precisely defined laboratory rats and mice. Gnotobiotic animals are ones in which all organisms present are known. All germ-free animals are gnotobiotic, but not all gnotobiotic animals are germ-free. An extensive monitoring system is a key component of a quality control program for gnotobiotic models. Swab testing of isolator interior surfaces. Moisten a swab with "dirty" drinking water, then swab caging, feed, feeders, floor surface. Randomly sample 10-12 cages per isolator. Collect both fresh feces and soiled bedding. Add water from several drinking water bottles. If testing will be done off-site, validate that your transport media can sustain viability during the length of transit time. What should you look for when choosing an animal model for microbiome research? Microbiome standardization may not be as critical as knowledge of the composition of the gut flora. Researchers require different microbiomes depending on their focus, as some bacteria are protective against a particular disease and causative or detrimental in terms of another. For instance, researchers studying collagen-induced arthritis have found that the presence of segmented filamentous bacteria (SFB) is required in order to get the desired immune response in the DBA/1 mouse model, but for some oncology models SFB can induce an undesirable inflammatory response. As there is significant variation in reporting among vendors, it is important to be aware of which agents are tested for in an animal's health profile. Model health reports are not always comprehensive. 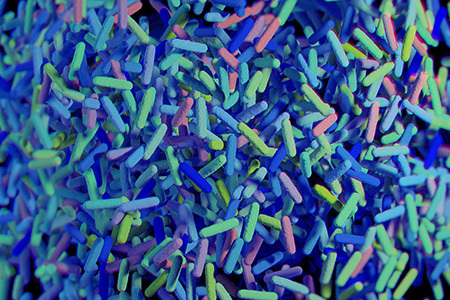 How can I know what the microbiome is for a particular mouse model? Different vendors, and even different production locations, may have variations in the microbiota of their animal models. For studies requiring a particular set of bacteria in the microbiome, it is best to start with a germ-free or Defined Flora model and add the bacteria of interest. The microbiome components for germ-free and Defined Flora models are explicitly known. This provides a controlled starting point for microbiome research. To assess the microbiome of a "conventional" research animal, 16S ribosomal RNA sequencing is commonly used. That level of information is not commonly available from commercial animal vendors at this time. Though some publications have reported that certain vendors have a particular gut flora, differences in production locations and changes over time make it difficult to replicate microbiome studies using mice that do not start with a particular, defined flora. Another option for some studies is treating mice with antibiotics. This is only suitable for certain study types. What support is available to researchers new to germ-free studies and the microbiome? A good starting point is to read 8 Best Practice Resources for Working with Germ-Free Mice and watch the videos from our germ-free workshops from 2011 and 2012. A recently published illustrated manual to gnotobiotic technology is a great reference for setting up a gnotobiotic facility and working with gnotobiotic mice. The 2016 AALAS National Meeting offers a series of workshops at different levels which are relevant to microbiome research. This workshop is a continuation of Workshop 101-A and is designed for those with little or no experience with flexible film isolators. The workshop will cover working with flexible film isolators and include: sterility testing, getting animals into and out of an isolator, day to day operations, and the costs of setting up and running a flexible film isolator. This workshop will include some hands-on work with flexible film isolators, germ-free shipper sleeves, and Trans Disks. This Workshop is sponsored in part by Class Biologically Clean, Ltd, National Gnotobiotic Rodent Resource Center University of North Carolina--Chapel Hill, and University of Colorado--Denver, Anschutz Medical Campus. This workshop is designed for those with little or no experience with flexible film isolators. The workshop will cover the different types of isolators, components of isolators, setting up an isolator and sterilizing an isolator. Workshop will include hands on work including wrapping filter stands, sterilizing cylinders, and setting up and sterilizing an isolator. W-08 Operation of a Gnotobiotic Mouse Husbandry and Technical Program "Gnoto 201"
This workshop is designed to complement the Isolators 101 workshop. It will help participants who have a basic understanding of flexible film isolators gain additional insights into practical aspects of their use. The workshop will cover isolator validation methods, husbandry and supply considerations, microbiological testing, and recordkeeping. This workshop targets anyone in the laboratory animal field interested in learning more about working in different isolators and caging systems, gnotobiotic facility management, and operation. The workshop will have an emphasis on operations that is geared to husbandry technicians, managers, veterinary technicians, veterinarians, research scientists, vendors, and more. This workshop integrates well with the popular and long-standing Isolators 101 workshop and the Development of a Gnotobiotic Mouse Husbandry and Technical Program "Gnoto 301" workshop. The information presented in this workshop is distinct from that presented in the Isolators 101 workshop and Development of a Gnotobiotic Mouse Husbandry and Technical Program "Gnoto 301" workshop. Suggestions from last year's inaugural workshop emphasized more time for the two main topics of the 2015 workshop, Development and Operation of a Gnotobiotic Mouse Husbandry and Technical Program. Therefore, operations topics are now featured in the Gnoto 201 workshop and development topics are explored in the "Gnoto 301" workshop. Presenters will guide the workshop attendees through operational considerations using hands on techniques and real-life scenarios. The workshop will also include advanced technical procedures. This Workshop is sponsored in part by Charles River, Class Biological Clean, and Tecniplast. W-12 Development of a Gnotobiotic Mouse Husbandry and Technical Program "Gnoto 301"
This workshop is designed to complement the Isolators 101 and Gnoto 201 workshops. It will help participants who have a moderate understanding of flexible film isolators gain insights in developing a gnotobiotic husbandry and technical program. The workshop will cover finding space, funding, choosing equipment, cost recovery and fee structure, staffing, and training. This workshop targets anyone in the laboratory animal field interested in learning more about gnotobiotics program facility design, management, and operation with emphasis on design and management. This includes managers, veterinarians, research scientists, vendors, and more. This workshop is distinct from, but integrates well with the popular and long-standing Isolators 101 workshop and Operation of a Gnotobiotic Mouse Husbandry and Technical Program "Gnoto 201" workshop. Suggestions from last year's inaugural workshop emphasized more time for the two main topics of the 2015 workshop Development and Operation of a Gnotobiotic Mouse Husbandry and Technical Program. Therefore, operations topics are now featured in the Gnoto 201 workshop and development topics are explored in the Gnoto 301 workshop. This Workshop is sponsored in part by Taconic, Class Biological Clean, and Allentown.